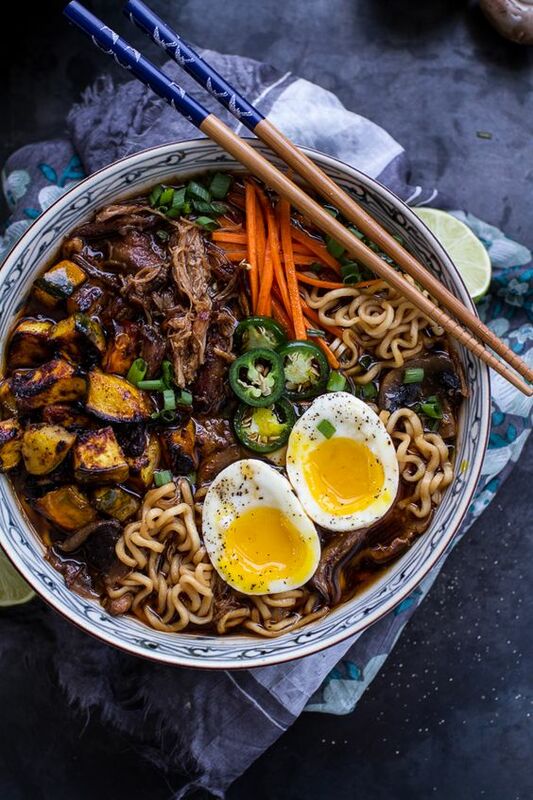 I found this recipe on Repinly in their most popular pins of all time list. I was looking for a side to go with some barbecue pulled chicken and this seemed like a good fit. It looked really fresh but hearty at the same time, and as a native Californian, I’m sold on anything involving avocado. As a bonus, Jennifer at Once Upon A Chef suggested making the salad the night before and just adding the avocado right before serving, which cut out a lot of prep time for a post-work meal. All the chopping and mixing of ingredients the night before took about a half hour from start to finish. I also took the suggestion of using canned black beans with fresh cooked corn, and boiled the husked corn cobs in water for about 6 min before cutting the kernels off. Although the recipe said to mix everything together in the bowl, I opted to put just the larger chopped vegetables and beans in the bowl first, and mix the rest of the ingredients in a separate container as a kind of dressing before mixing everything together. I think this was a good call, since it allowed the sugar, salt and cayenne pepper to get dissolved in the lime juice and oil, and it felt like the garlic, shallots and lime zest were more evenly distributed throughout the salad when poured on as part of the dressing. Jennifer wasn’t kidding when she said it was a lot of chopping, but I found that juicing the limes was relatively quick using a handheld lime press like this one. The day of, I chopped up the two avocados and kind of folded them in with the ingredients I’d mixed together the night before. 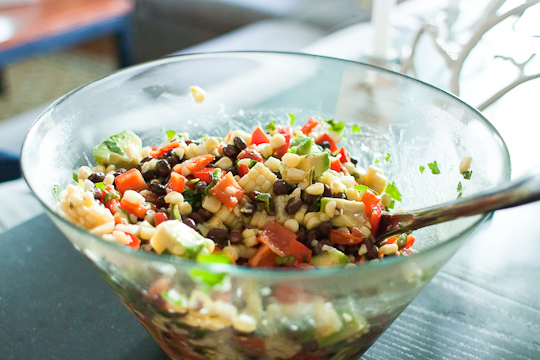 To be honest, it felt more like a chunky salsa you’d eat with tortilla chips than a salad. I actually tried it with some chips and it was pretty good, so I’ll be keeping this in mind for tailgate season. It also tasted great on its own as a salad – very fresh and citrus-y – and went well with the barbecue pulled chicken, which is a recipe I highly recommend from the Cook’s Illustrated cookbook. All in all, this salad recipe was relatively simple to make and offered a nice healthy side dish, so I’ll be keeping it in mind for future meals. 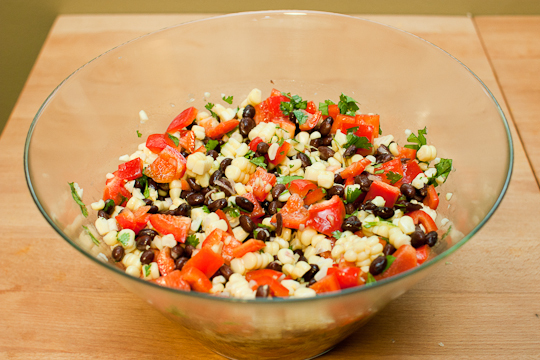 Combine the black beans, corn, peppers and cilantro in a large bowl. Wisk together the garlic, shallots, salt, cayenne pepper, sugar, olive oil, lime zest and lime juice in a separate container. 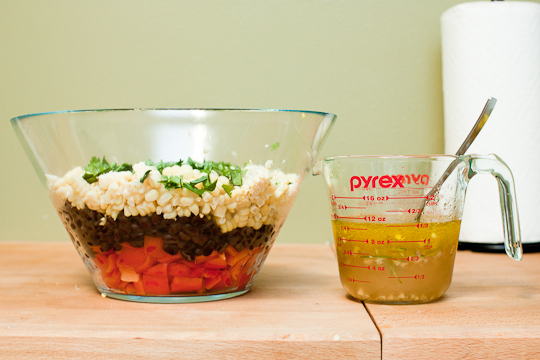 Add the vinaigrette to the larger bowl and mix well. Cover and chill for a few hours or overnight. Right before serving, add avocados and mix gently. Garnish with more chopped cilantro if desired and serve at room temperature. * One thing I should note is that the recipe definitely makes a lot of salad. There were four of us and it felt like we barely made a dent in it, so I’d say it’s definitely closer to eight servings than six servings if you’re eating it as a side.